The movie version of Triumph in the Skies <衝上雲霄> will be released in Mainland China and Hong Kong on February 19, 2015, competing against Sandra Ng’s (吳君如) 12 Golden Ducks <12金鴨> and Chow Yun Fat’s (周潤發) From Vegas to Macau 2 <賭城風雲2> for the Lunar New Year box office. Co-produced by Media Asia and Shaw Studios, Triumph in the Skies is directed by Wilson Yip (葉偉信) and Matt Chow (鄒凱光). 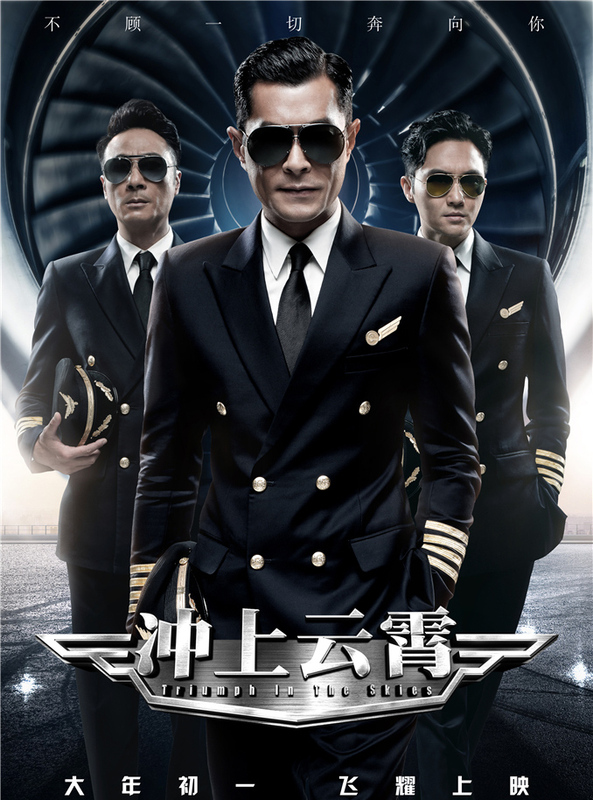 A movie adaptation of the TVB series, original cast members Francis Ng (吳鎮宇), Chilam Cheung (張智霖), Kenneth Ma (馬國明), Elena Kong (江美儀), and Oceane Zhu (朱璇) reprise their original roles. The film also includes new cast members Louis Koo (古天樂), Sammi Cheng (鄭秀文), Amber Kuo (郭采潔), and Charmaine Sheh (佘詩曼). Triumph in the Skies takes place a few years after the TVB drama, and centers on three different romantic story arcs starring the six main leads. better than the other trailer. The posters look funny. They look like a cross over between stick figures and bobble heads lol. This should come out on valentine’s day instead. Actually looking foward to the Lunar New Year movies this time. And she almost look like one of the guys? haha… seriously…wow… does she ever eat? Why is everyone captain in this movie? and personally, a bad time to release this film with so many plane crashes, etc. It is no longer glamarous but dangerous. Take them out of the planes to anywhere else and the story will still bomb big time because in the end it is just a poor excuse of a movie. Oh wait!! Sammie is a pilot right? Ok, at least ONE female pilot. If she is a captain too, ALL FOUR in one plane.. wow, way too many captains. Just so wrong on so many levels. The tagline is in very poor taste! Can’t wait for this lame excuse of a movie to bomb! Sammi isn’t a pilot in this movie. She will be portraying a rockstar who dress up as a pilot for a commercial for (Louis’) airline company. Sigh. A rock star. They need a female pilot or a gay pilot. Or someone lower ranked. This is not Triumph In The Skies. Should be Captain In Love. Having watched the 2 trailers confirms my suspicion that this movie is total rubbish! The series was rubbish too and look how overrated it became? Totally insane. Why is Louis Koo in the center of the male lead poster? There are more posters. Each with an other main actor/actress at the front. Jaynestars is just showing 2 of them. Check it out on Charmaine & Louis hot passionate kisses…good, good, good! If it were not for Francis Ng I will never even consider this movie. Just beautiful meaningless scenery and pretty people, just like Triumph in the Skies 2 (except the drama is probably better since there was SOME plot about aviation and SOME well-developed characters). I hope the actual movie will reject my assumption today.